In fact, because moving the jaws also moves the teeth, orthognathic surgery is usually performed in conjunction with orthodontics so that the teeth are in proper position after surgery. The objective of orthognathic surgery is the correction of a wide range of minor and major facial and jaw irregularities, and benefits include an improved ability to chew, speak and breathe. In many cases an enhanced appearance can also result. Pre-surgical orthodontics will move your teeth into a new position, so they will fit together properly when the jaws are surgically re-positioned. During this pre-surgical orthodontic phase of treatment, which usually lasts 6-18 months, you will be wearing braces and will visit your orthodontist regularly for necessary adjustments to your braces and ongoing evaluation. Because your teeth are being moved into a position that will be correct after surgery, you may think that your bite is getting worse rather than better during this phase of treatment. However, when the oral and maxillofacial surgeon realigns your jaws into proper alignment during orthognathic surgery, the teeth will be moved into proper position. After surgery, final orthodontic tooth movement is usually necessary to “fine-tune” your bite. Following removal of your braces, you may be required to wear a retainer. If you still have your wisdom teeth or your teeth are too crowded, it may be necessary to remove certain teeth prior to beginning orthodontic treatment in order to make space for proper tooth movement. Orthognathic surgical procedures last anywhere from one to several hours, depending on the amount and type of surgery needed. In lower jaw surgery the rear portion of the jawbone behind the teeth is separated and the tooth-bearing portion is moved forward or backward, as appropriate. 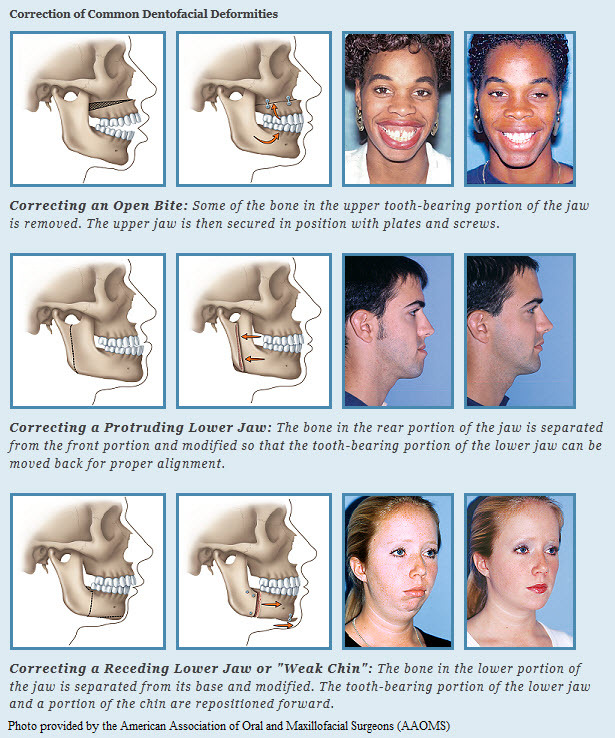 In upper jaw surgery, the jaw can be re-positioned forward or backward, or the jaw can be raised or lowered. Certain movements may require the jaws to be separated into several parts, with bone added or removed to achieve the proper alignment and stability. Other facial bones that contribute to the imbalance may also be re-positioned, augmented, or reduced in size. In most cases, incisions are made inside the mouth and there will be no visible external scars. If it is necessary to make an external incision, care is taken to conceal it in natural skin creases. When you leave the hospital or surgical facility, you should be able to return to work or school as soon as you feel like it, often within two weeks for most people. Your appearance may have changed somewhat due to the re-positioning of your jaws and associated swelling, so you should be prepared for signs of surprise from your family and friends. It won’t take long for them to adjust to the “new” you. You will see the oral and maxillofacial surgeon and the orthodontist for regular evaluation visits, and it is very important that you keep these appointments. The surgeon will monitor your healing, and at the appropriate time, remove fixation devices if they were used. The initial healing phase will take approximately 6 weeks, but completion of the healing process will take 9 to 12 months. During the entire healing phase, it is critical that you practice the best possible oral hygiene. Your surgeon and orthodontist can assist you in this area, and may recommend the use of some special oral care devices. The orthodontist will usually begin the post-surgical phase of orthodontic treatment 4 to 8 weeks after surgery to “fine tune” your bite. In most cases, braces are removed within 6 to 12 months following surgery.